The Bogen KFLDS30T is a wide dispersion, high-intelligibility, reentrant-type horn loudspeaker designed for applications where wide angle projection and directivity is a necessity. 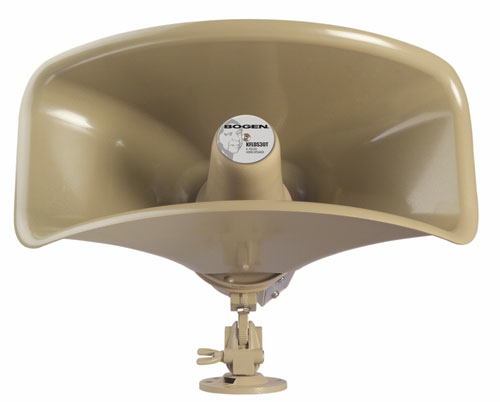 The flare-shaped horn can be rotated to project wider dispersion in either the horizontal or vertical plane. The speaker’s all-purpose tilt-and-swivel base simplifies installation and positioning. Its sturdy, weatherproof, polycarbonate and aluminum construction is ideal for both indoor and outdoor use.